You know the feeling. You just came home from the hardware store with a blister pack of brand new, energy-saving CFLs. You screw them in and hit the switch. "Oh, this is gonna be good," you say to yourself. You're going to save tons of money and your bulbs are gonna look great! Then you notice they're dim, really dim. Defeated, you retreat to another room to find your receipt. But then, when you return a minute or so later, they're as bright as you expected them to be! What sorcery is this? Everyone has had this experience with their first batch of CFLs, though maybe it wasn't as melodramatic. To understand why compact fluorescents start off dim, you have to know a bit about how fluorescent lighting works. Unlike an incandescent bulb, which creates light by heating a filament until it is white-hot, fluorescent lights use cathodes to heat a special gas or mix of gases to create UV light. The UV light is then filtered through phosphors to create white or colored light. To do this however, the cathodes have to warm up. Every new CFL on the market uses different proprietary technology to shorten the bulb's warm-up time, with varied results, so we chose to test four of our best-selling 60 watt CFLs. Though this is far from a scientific study, here's how we conducted the experiment: We screwed each bulb into a lamp, and set a light meter about one foot to the side the lamp. We propped up the light meter so it was roughly on the same horizontal plane as the CFL's midpoint. We then turned on each bulb and used the light meter to record the maximum light output of the bulb. Finally, we replaced the bulbs with identical bulbs of the same make and model (using the already warm bulb would have skewed our results). We then switched the bulbs on and recorded the time it took to meet the previously recorded maximum output. The first bulb we tested is a 13 watt, 2700K CFL from Energy Miser. Just over $1.00 each, this bulb is not only the most inexpensive of the bulbs we tested, but it's also our best seller. The manufacturer doesn't make any claims about the bulb's warm up time, though our customers have given it an average 5-star rating. In our tests, the bulb reached its maximum output in 2 minutes, 2 seconds. That's not exactly quick, but according to most manufacturers, it's about on par for a typical CFL. The second bulb we tested, a TCP TruStart, is a fairly new addition to our product line. In their spec sheet, TCP claims this bulb is the "Best on/off CFL ever made!" Unlike the previous bulb we tested, TCP does make a claim about this bulb's warm-up time; specifically, TCP says the CFL has a less than 30 second warm-up time. Our tests showed this claim to be mostly true, with the bulb reaching its full brightness at 38.7 seconds. The third bulb we tested is from the "big three" of lighting manufacturers, Sylvania. Sylvania also doesn't make any specific claims about warm-up times for this 13 watt CFL from their DULUX EL family, nor do our customers (who give it an average 4-star rating). So how did this name brand product fare? Pretty well, it turns out. The bulb reached its full brightness at 1 minute, 7 seconds. That not as good as the TCP TruStart, but it's nearly twice as fast as the Energy Miser. The final bulb we tested is a little different from the other four we tested. This covered CFL from TCP has a glass cap over the fluorescent spiral tube so that it looks more like a typical A-shape incandescent bulb. In their InstaBright G2 brochure, TCP claims the bulb has the "Fastest run-up time and significantly improved light build up time," and it is supposed to reach full brightness in 45 seconds. Surprisingly, this bulb beat even its own estimates, reaching full brightness in only 35.1 seconds! Which of these bulbs should you buy? It depends how much you're willing to pay and how much you value fast warm-up times. 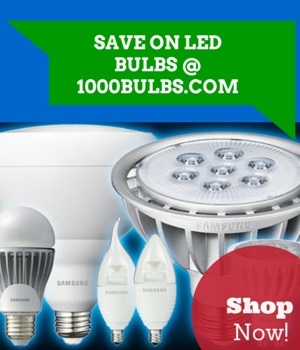 There is a spread of more than $4.00 between the cheapest and most expensive of these bulbs. Is a few seconds quicker to reach full brightness worth the premium? Let us know what you think in the comments, or connect with us on Facebook, Google+, and Twitter. Jul 20 Get Your LED Christmas Lights Early!